During the 1999-2000 NBA season, Mark Cuban purchased a majority stake in the Dallas Mavericks for $280 million from Ross Perot. Since then, Cuban has become one of the more prominent owners in North American sports. In addition to being one of the most quotable team owners, the Mavericks have posted at least 50 wins in each of his 10 seasons while he was holding the reins, compiling a .687 winning percentage. In the 10 seasons prior to taking control, the Mavericks did not have a single winning season, and had a .303 winning percentage. But where we can really see the impact of Cuban is in the value of the franchise (according to Forbes.com). Prior to Cuban, the Mavs were consistently one of the five least valuable teams in the NBA. 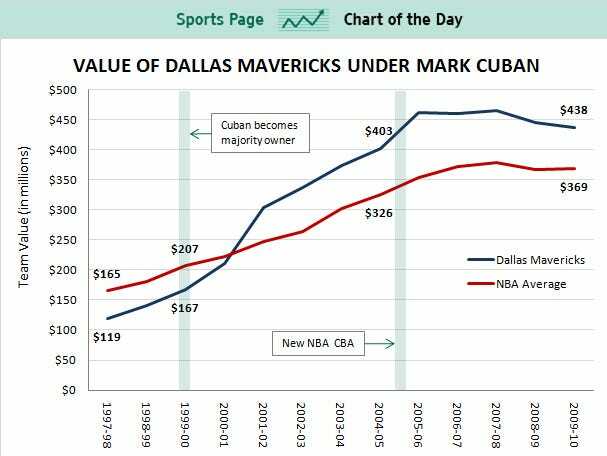 After Cuban took over, the team almost immediately saw their value jump above the league average (see below) and in recent years, the Mavericks have been among the NBA’s most valuable franchises. Since Cuban took over the Mavericks, the value of the team has risen 162.3%, easily outpacing the growth of an average NBA franchise during the same period (77.8%). Even though the value of the team has dipped a little recently under the current Collective Bargaining Agreement — a pattern seen throughout the NBA — the Mavericks were still the sixth most valuable franchise when Forbes released their most recent rankings.